I started this piece shortly after I was evacuated. It was a really strange period of waiting- what had started with my dad and I watching the red glow in the distance from our roof had swept into town and threatened my childhood home more quickly than I could have ever imagined- I was powerless to do anything but draw. 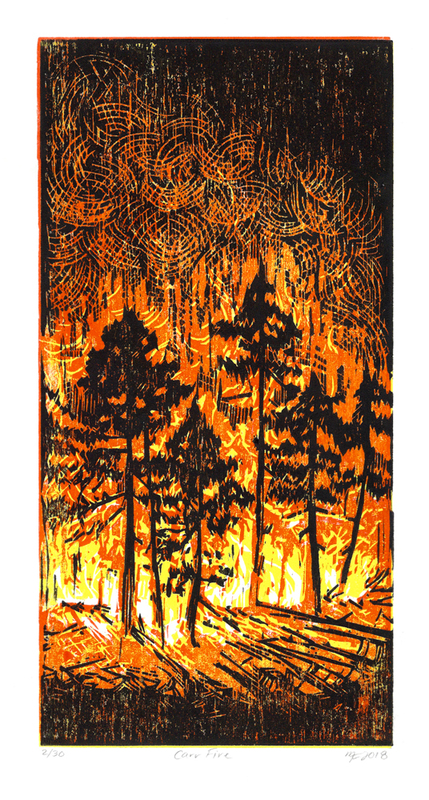 Typically my prints are done on linoleum since it doesn't have a grain and is easier to carve, but this one is on wood- I wanted to convey a lack of control, the crackling hunger of the fire and the deep ache of uncertainty- for myself and my hometown.